Going on pilgrimage is to set off on a journey to a sacred place with the hope of experiencing an inner change, a healing, openness to others and to God. 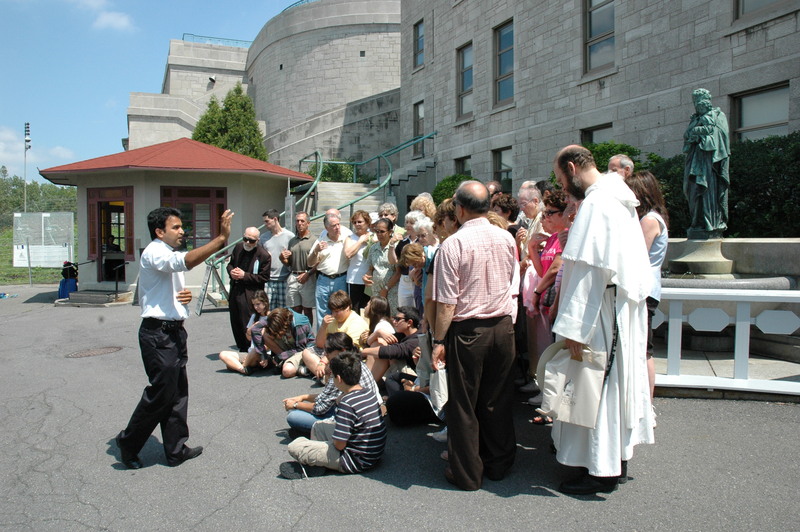 At Saint Joseph’s Oratory of Mount Royal, pilgrims pray, perform devotional acts, celebrate the Eucharist and leave feeling revitalized. The shrine, perched on the mountaintop, was founded by Saint Brother André, to minister to people of all religious persuasions and indeed all truth-seekers. Some make a pilgrimage to the Oratory every week; others return faithfully each year, either alone, with their family or in a group. People of all ages and from all backgrounds are welcome. Are you planning a group-pilgrimage to the Oratory ? Adapt your visit according to your needs and your schedule. We strongly request that you make reservations in advance with one of our assistants in the Office of Visitor and Pilgrim Services, 514 733-8216 ext. 2790 or pelerinage@osj.qc.ca, who will assist you in planning your day. Remember that the cozy John XXIII Pavilion Hotel can accommodate you for overnight stay. The Work of the Pilgrimage of the Sick provides for the needs of sick, elderly and disabled persons when they visit the shrine of come for a pilgrimage. 9:00 Arrival, brief encounter with your guide or a religious. 9:15 Begin your visit: Votive Chapel, Crypt Church (moment of contemplation and prayer), tomb of Brother André, exhibit on the life of Brother André, Basilica, Saint André Bessette Chapel, Blessed Sacrament Chapel, Chapel of Origin, time for silent meditation. 11:00 Free time: personal devotions, Sacrament of Reconciliation, consultation. 11:30 Mass in English in the Crypt Church. 12:15 Lunch time. It is advised to pre-order a lunch menu for your group. 13:00 Free time, visit to the gift shop. 14:00 Gather for a final moment of prayer and for a blessing. Presentation about Saint Brother André and Saint Joseph.